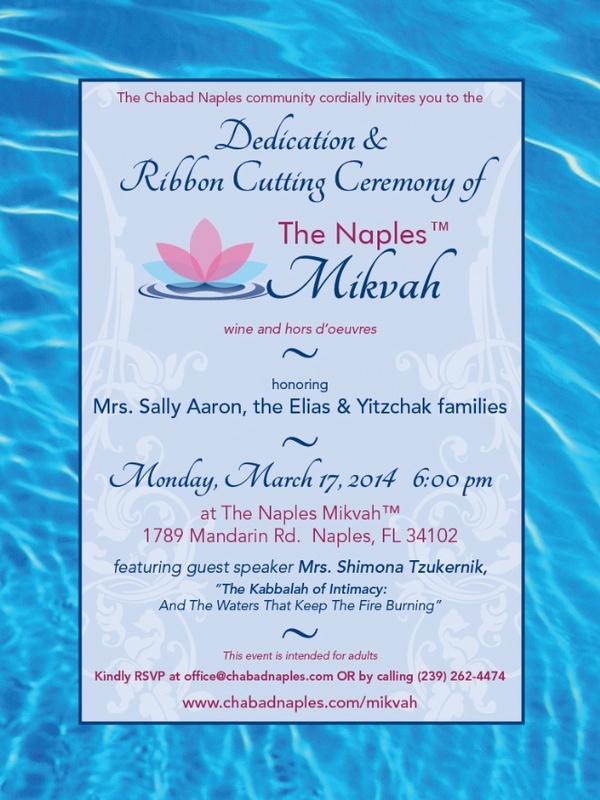 It is with a great deal of pleasure and excitement that after years of careful planning and construction, we extend this invitation to the Chabad of Naples Mikvah dedication, on Monday, March 17th at 6 p.m.
We will officially open the Mikvah by honoring its founders: Mrs. Sally Aaron, and the Elias and Yitzchak families with a dedication and ribbon-cutting ceremony followed by mimosas and light refreshments. What an incredible gift to the community! we encourage you to participate in this mitzvah — now is a great time to join the completion and dedication opportunities by contributing to this worthy project. We will welcome renowned speaker Shimona Tzukernik, known as The Kabbalah Coach. Shimona is considered one of the foremost female authorities on Kabbalah in the world. Using her knowledge of Kabbalah, she founded the Kabbalah Coaching Method for individuals and corporations seeking spiritually based transformation. Shimona has been featured in media around the world including a documentary by National Geographic. Her upcoming radio shows “Kabbalah Coach On Call” and “Business, Blessing and Balance” will air weekly. As an internationally recognized speaker, Shimona has addressed tens of thousands of participants on a vast range of topics across five continents, empowering her listeners to shift on a personal and ultimately global level. Come and make history with Chabad of Naples!